Before or after breakfast? Every time we eat? There’s plenty of debate and curiosity amongst our patients about when we should be brushing our teeth. It’s one of the most fundamental things that we can do to make sure our teeth are clean and healthy. It only takes a few minutes out of your day and it’s important that this time is spent cleaning your teeth correctly. We recommend brushing after breakfast so that any sugars or acids from your food can be cleaned away from the teeth. Make sure to leave a short period of time between brushing and eating, though, as some foods can cause some minimal softening to the enamel, meaning that teeth may wear down very slightly when you brush them. The only rule we have when brushing at night is making sure that you only consume water after you’ve brushed. Any other food or drink will leave sugars or food particles in your mouth while you sleep, producing harmful acids that will wear away enamel and cause decay. Always go to sleep with clean teeth! It’s important that you replace your toothbrush every 3 months, or when the bristles are splayed. It won’t clean your teeth correctly otherwise! Always make sure your toothpaste contain fluoride. Most do, however it’s always worth checking just in case. Brush your teeth for a minimum of two minutes, in gentle circular motions. When spitting, don’t rinse your mouth – only do this with a fluoride mouthwash! This means that there’ll be better fluoride absorption, thus protecting your teeth and gums. 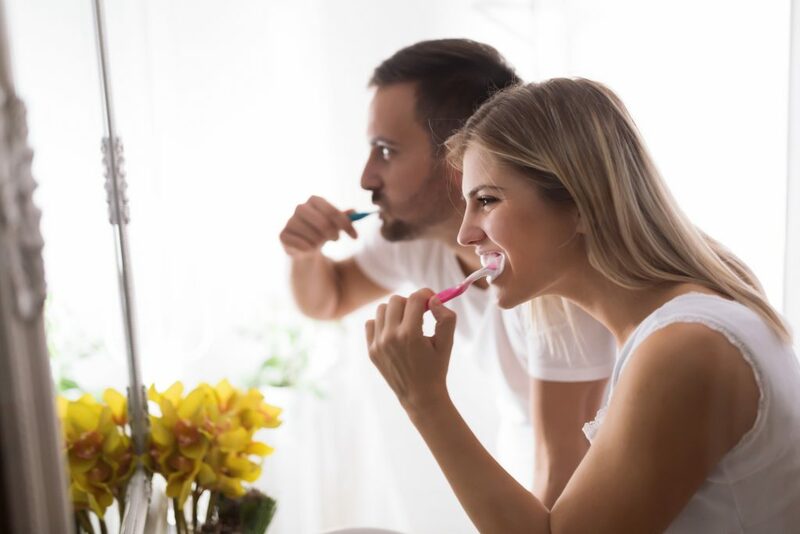 If you ever have any questions about the way you’re brushing, or just want some more information on improving your oral hygiene routine, don’t hesitate to get in touch with us. Call us on 0151722 3000 to see how we can help.